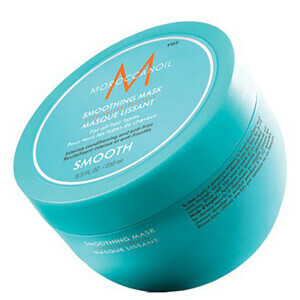 The Moroccanoil Smoothing Mask is an intense conditioning treatment that targets frizzy, unmanageable hair. Specially formulated with nutrient-rich ingredients, including argan oil and argan butter to deeply hydrate locks, leaving them soft and smooth. Coconut-derived fatty acids boost elasticity and provide moisture for long lasting results. E.N. Directions for use: Comb a small amount through towel-dried hair and leave for 5-10 minutes. Rinse well. Use once a week. Aqua/Water/Eau, Cetearyl Alcohol, Cyclomethicone, Argania Spinosa (Argan) Kernel Oil, Ceteareth-20, Parfum/Fragrance, Behentrimonium Chloride, Hydrolyzed Vegetable Protein PG-Propyl Silanetriol, Hydrogenated Vegetable Oil, PEG-60 Almond Glycerides, Dimethicone, Isopropyl Alcohol, Acetamide MEA, Caprylyl Glycol, Steareth-2, Disodium EDTA, Glyceryl Stearate, CI 26100 (Red 17), CI 47000 (Yellow 11), Potassium Sorbate, Chlorphenesin, Phenoxyethanol, Eugenol, Alpha-Isomethyl Ionone, Butylphenyl Methylpropional, Linalool, Hydroxyisoheyl 3-Cyclohexene Carboxaldehyde.